I’m very excited to finally share today’s announcement from Binance Blockchain Week in Singapore. By way of BloqLabs, we have been busy working in stealth mode on a way to make crypto mining easier, more profitable, and more scalable. Introducing Titan. 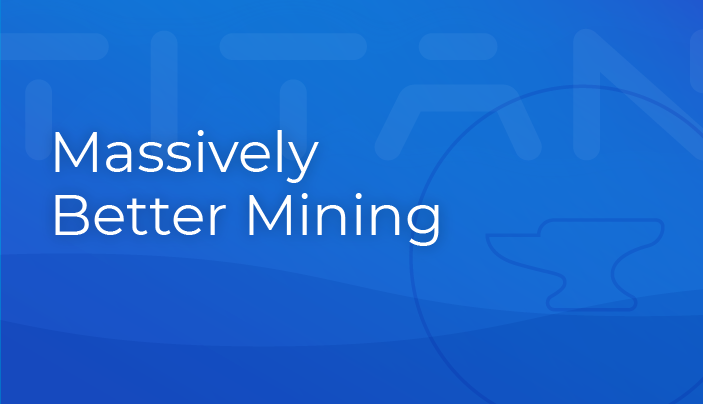 Starting today, we are opening up our beta waitlist, which will give crypto miners early access to our tools for automated, optimized mining. The fact is, managing mining hardware is a very manual process. Not only do you have to individually access and configure each device, but you must continually monitor and adjust your devices to make sure that they are online and mining the most profitable coin. Additionally, there’s the balancing act of managing operational costs and physical infrastructure concerns, such as electricity costs, wire management, and heat dissipation. Titan CTO Kyle Howlett (creator of the popular CoinWarz site) and I have been working in the mining space since 2012, building tools that we’ve used to maximize our own ROI. We are now ready to take it to the next level — a fully integrated and comprehensive software suite that not only utilizes all of our existing tools, but adds a whole new layer of automation and optimization onto any mining operation. With Titan, we will bring true plug-and-play capabilities to mining. Once each device is physically set up and networked, Titan takes care of the rest. Titan will have several exciting features that we will be disclosing in the coming months. In the meantime, sign up for notifications about our beta program and follow @titan_mining on Twitter. Ryan Condron is a principal blockchain engineer at Bloq and CEO of Titan. Bloq is comprised of innovators, builders, entrepreneurs, enthusiasts, and otherwise passionate individuals who are drawn together by the potential of blockchain technology, cryptocurrency, and tokenization. Even within such a group, though, we manage to hold diverse opinions about our industry. This helps us see around all the corners in this dynamic space. It also helps put your ears to new and different doors. Sync is as much a vehicle for those individual voices — perhaps more so — as it is the overall voice for Bloq. Welcome. Bloq delivers comprehensive, enterprise class blockchain solutions to Bloq is a leading blockchain technology company, providing enterprise-grade software, services and support through its BloqEnterprise and BloqThink suite of solutions. Bloq is led by a world-class team of blockchain developers, entrepreneurs and investors. BloqLabs originates, sponsors and supports innovations in leading edge decentralized networks and applications. For more information, please visit bloq.com, and follow us on Twitter: @bloqinc. Stay plugged in to Bloq via email updates. Bloq delivers comprehensive, enterprise class blockchain solutions to business, while continuing to support innovation in the blockchain and open-source ecosystem. Copyright © 2018 Bloq, Inc.